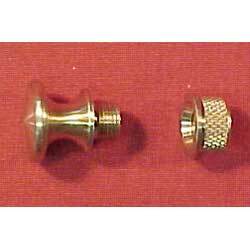 The solid brass plugs screw securely into a brass bushing set permanently in the horn base. Plug can be removed easily to make filling the horn a snap. The flared button shape of the plug provides secure strap attachment. Plug & bushing available in large or small, large to fit main horn or small to fit priming horn.